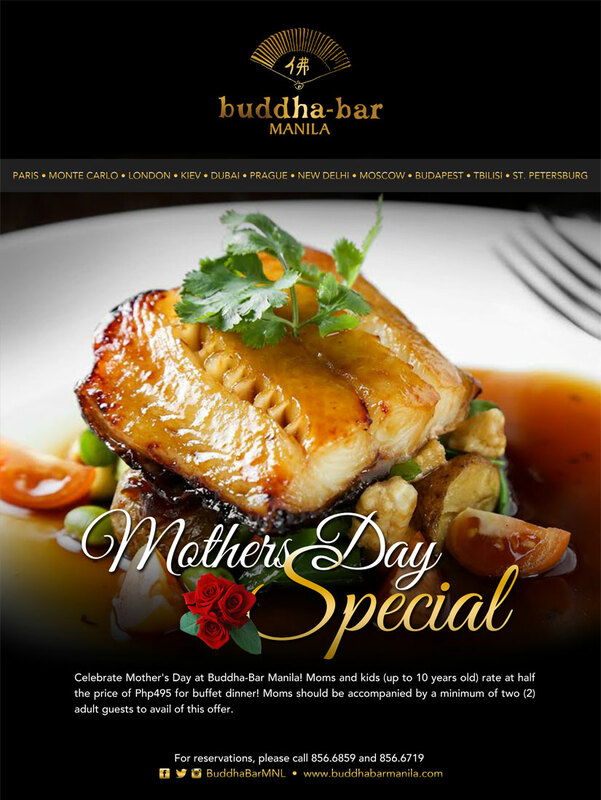 Celebrate Mother’s Day at Buddha-Bar Manila and give mom a wonderful gift. As a special treat on May 8, mothers will get a 50% discount on their buffet when they dine in Buddha-Bar Manila accompanied by a minimum of two adult guests. The Mother’s Buffet menu of features Buddha-Bar Manila’s signature Pacific Rim flavors mixed with classic European dishes. Start off with a choice of Chunky Potato Soup or Asian Mushroom Soup with Crispy Wanton Skin. Whet your appetite with a selection of savory bites such as Pulled Pork Pizzetas Ceviche, Smoked Salmon Mousse, Fried Dimsum, Petite Spring Rolls and more. The main course is a feast that features Baked Fish with Pesto Veloute, Chicken Vindaloo, Beef Kofta with Yogurt and Fresh Relish, Pork Schnitzel with Roasted Potatoes or Braised Hunan Pork, Wok Fried Vegetables with Tofu or Fresh Vegetable Spring Rolls with Peanut Sauce, and Spaghetti Bolognese or Thai Style Noodles. Finally, cap off a delicious dinner with a slew of sweet treats such as Mango Mousse Dome, Mint Chocolate Cake, Blueberry Fudge Cheesecake and more. Mothers deserve all the love and pampering they could get. Make them feel special on this special day only at Buddha-Bar Manila. The Mother’s Day Buffet is at Php 990 (net) for adults and Php 495 (net) for children up to 10 years old. The Buffet starts at 5:00PM.